The Hoffman Estates Police Facility located in Hoffman Estates, Illinois is a brand-new, state-of-the-art 70,000 square foot Police Facility that is showing support for the environment by contracting Metalmaster Roofmaster to install LiveRoof® brand Hybrid Green Roof System Products. LiveRoof® is a top manufacturer in pre-vegetated modular green roof systems. The facility also includes a Firestone 60-mil white TPO roofing system, Berridge standing seam metal roofing and a Wausau pavered walkway system. Metalmaster Roofmaster is pleased to be a part of another successful installation of roofing products with LiveRoof®, Firestone Building Products and Berridge Manufacturing Company. 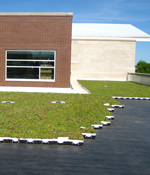 For more information on the type of roofing system installed on the Hoffman Estates Police Facility, or to find out more information on green roofing systems, please visit feel free to contact our office. This entry was written by connor, posted on June 17, 2010 at 4:27 pm, filed under Green Roofing. Bookmark the permalink. Follow any comments here with the RSS feed for this post. Comments are closed, but you can leave a trackback: Trackback URL.